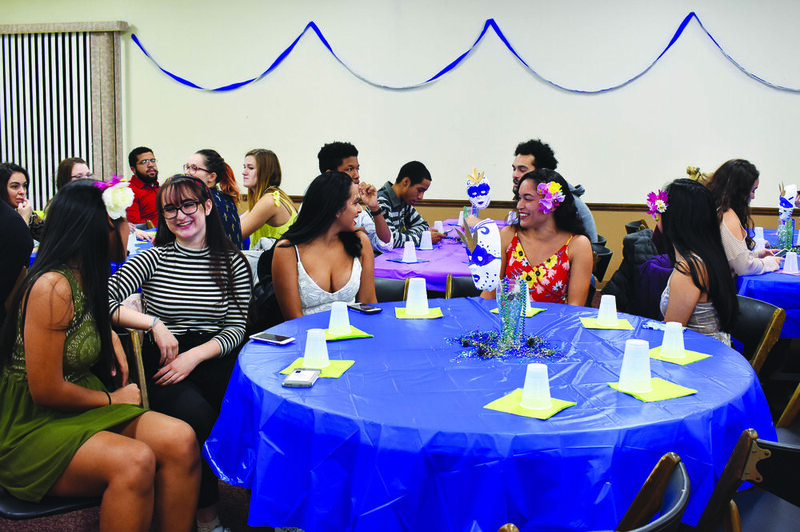 The Interfaith Center rang with music, dancing and laughter while the Latino Student Association hosted their annual “La Mezcla: Carnaval.” Students and faculty came to the sold-out event to celebrate Hispanic culture. The room was brightly decorated with carnaval masks; beads were placed on tables for people to wear and student photographers were present to take pictures of groups. One of the features of the event, held on Saturday Nov. 11, was a best-dressed contest—people came dressed up in their most festive carnaval attire, wearing bright florals and colorful jewelry and often accessorizing with bejeweled makeup. There was also a photo booth in front of a tapestry—painted with a brightly colored bird and the words “La Mezcla: Carnaval”—where many students had the photographers take pictures of them. The event was catered by D’Mangu, a Dominican restaurant located in Rochester. The goal of choosing Dominican food was to steer away from stereotypical Hispanic cuisine and unearth the much broader culture of Latin America to attendees. Soria has been on the LSA e-board since her freshman year. She hopes that the Carnaval will expose people to the club and get them to attend meetings. Echoing this sentiment was psychology major freshman Elena Camilo. Students organized and ran the event all by themselves. After eating, students danced to a wide variety of Hispanic music.